Roto Frank AG is one of the world's leading producers of hardware technology for windows and doors and a major supplier of roof windows and loft ladders. The Group of companies consists of 17 production facilities and more than 40 international sales companies. With a workforce of some 4,500, it generates net sales of over 620 million Euros. 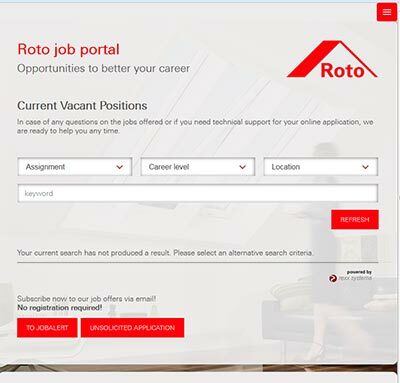 In applicant management, Roto has been relying on rexx Recruitment and its career portal since 2016, thus allowing corporate identity, employer branding and job advertising to be brought together conveniently under one roof. Important for a company with worldwide locations is what is referred to as multi-client capability. rexx Recruitment scores highly here with its various options. This not only makes it possible to design templates for job advertisements, headers and footers for email communications or permissions specific to each company, but also individualise processes or permissions for each site. The switch to the new version of the rexx Enterprise Recruitment software was carried out for the DACH region at the end of 2016. As a part of this, a complete relaunch of the Roto Frank Career Portal took place in responsive design. This means that visitors to the portal now get to see the job postings and additional information concerning the application process displayed customised for each screen size layout, regardless of whether you are using a standard desktop PC, tablet or smartphone. As the new release offers many more possibilities for elegantly supporting processes, and specially launched careers pages, it is now being introduced at Roto Frank sites in six other countries: France, Italy, Hungary, Poland, Great Britain and The Netherlands. Roto is not without reason one of rexx systems' most satisfied customers. The many years of excellent cooperation with the Customer Advisory Team and the professional support provided by experienced consultants during the migration phase show how smoothly software projects can run. "Once we had taken a detailed look at the new Enterprise Recruitment system, the migration went ahead with absolutely professionality. We are looking forward to going live with the system in six new countries. My thanks go out to the consultants at rexx systems and the advice and action they provided us as support!" As with all rexx Recruitment customers, Roto Frank jobs are automatically published on the free German-language job portal www.finest-jobs.com. Since 2006, Roto Frank has been working on rexx Recruitment. The release change is now being rolled out in six countries.